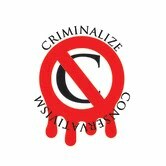 Criminalize Conservatism: Sequestration: Conservative Victory! From the Huffington Post, Robert Reich's post, "the Sequester And The Tea Party Plot," fits in with our premise that "Conservatism" is a criminal conspiracy, a much more insidious organization than a mere political philosophy. "Imagine a plot to undermine the government of the United States, to destroy much of its capacity to do the public's business, and to sow distrust among the population. "Imagine further that the plotters infiltrate Congress and state governments, reshape their districts to give them disproportionate influence in Washington, and use the media to spread big lies about the government. "Finally, imagine they not only paralyze the government but are on the verge of dismantling pieces of it. "Far-fetched? Perhaps. But take a look at what's been happening in Washington and many state capitals since Tea Party fanatics gained effective control of the Republican Party, and you'd be forgiven if you see parallels. 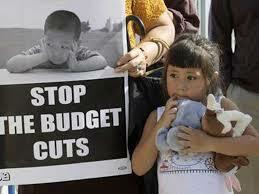 "Tea Party Republicans are crowing about the 'sequestration' cuts beginning today (Friday). 'This will be the first significant tea party victory in that we got what we set out to do in changing Washington,' says Rep. Tim Huelskamp (Kan.), a Tea Partier who was first elected in 2010. "Sequestration is only the start. What they set out to do was not simply change Washington but eviscerate the U.S. government -- 'drown it in the bathtub,' in the words of their guru Grover Norquist -- slashing Social Security and Medicare, ending worker protections we've had since the 1930s, eroding civil rights and voting rights, terminating programs that have helped the poor for generations, and making it impossible for the government to invest in our future. "To avoid default on the public debt, the White House and House Republicans agreed to harsh and arbitrary 'sequestered' spending cuts if they couldn't come up with a more reasonable deal in the interim. But the Tea Partiers had no intention of agreeing to anything more reasonable. 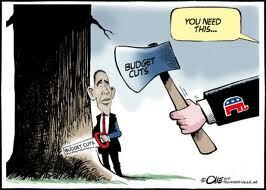 They knew the only way to dismember the federal government was through large spending cuts without tax increases. 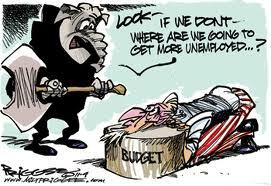 "Nor do they seem to mind the higher unemployment their strategy will almost certainly bring about. Sequestration combined with January's fiscal cliff deal is expected to slow economic growth by 1.5 percentage points this year - dangerous for an economy now crawling at about 2 percent. It will be even worse if the Tea Partiers refuse to extend the government's spending authority, which expires March 27. "A conspiracy theorist might think they welcome more joblessness because they want Americans to be even more fearful and angry. Tea Partiers use fear and anger in their war against the government -- blaming the anemic recovery on government deficits and the government's size, and selling a poisonous snake-oil of austerity economics and trickle-down economics as the remedy. "They likewise use the disruption and paralysis they've sown in Washington to persuade Americans government is necessarily dysfunctional, and politics inherently bad. Their continuing showdowns and standoffs are, in this sense, part of the plot. "What is the President's response? He still wants a so-called 'grand bargain' of 'balanced' spending cuts (including cuts in the projected growth of Social Security and Medicare) combined with tax increases on the wealthy. So far, though, he has agreed to a gross imbalance -- $1.5 trillion in cuts to Republicans' $600 billion in tax increases on the rich. "The President apparently believes Republicans are serious about deficit reduction, when in fact the Tea Partiers now running the GOP are serious only about dismembering the government. "And he seems to accept that the budget deficit is the largest economic problem facing the nation, when in reality the largest problem is continuing high unemployment (some 20 million Americans unemployed or under-employed), declining real wages, and widening inequality. Deficit reduction now or in the near-term will only make these worse. "Besides, the deficit is now down to about 5 percent of GDP -- where it was when Bill Clinton took office. It is projected to mushroom in later years mainly because healthcare costs are expected to rise faster than the economy is expected to grow, and the American population is aging. These trends have little or nothing to do with government programs. In fact, Medicare is far more efficient than private health insurance. "I suggest the President forget about a 'grand bargain.' In fact, he should stop talking about the budget deficit and start talking about jobs and wages, and widening inequality - as he did in the campaign. And he should give up all hope of making a deal with the Tea Partiers who now run the Republican Party. Instead, the President should let the public see the Tea Partiers for who they are -- a small, radical minority intent on dismantling the government of the United States. As long as they are allowed to dictate the terms of public debate they will continue to hold the rest of us hostage to their extremism." "ROBERT B. REICH, Chancellor's Professor of Public Policy at the University of California at Berkeley, was Secretary of Labor in the Clinton administration. Time Magazine named him one of the ten most effective cabinet secretaries of the last century. He has written thirteen books, including the best sellers 'Aftershock' and 'The Work of Nations.' His latest is an e-book, 'Beyond Outrage,' now available in paperback. He is also a founding editor of the American Prospect magazine and chairman of Common Cause. "The impact of the impending series of automatic federal spending cuts, popularly known as the sequester, on Indiana became the focus of a White House report released over the weekend by the Obama administration. The report detailed the economic and social fallout the cuts will likely cause in Indiana when it goes into effect Friday. "Everything from Indiana’s military readiness, to education, health programs and social services will be impacted by the $85 billion cuts slated to occur over the course of the next seven months. 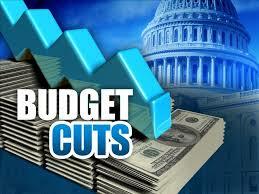 "Indiana’s military sector is scheduled to receive the deepest cuts. Around 11,000 civilian Hoosier employees of the Defense Department may be furloughed, amounting to what the White House describes a drop in gross income of more than $64 million in total. $1.7 million in funding for Army base operations and $7 million for Air Force operations will also disappear. "Indiana would also lose $3.3 million in funding for the environment and the state would lose more than $800,000 in meal assistance for seniors among many other cuts. 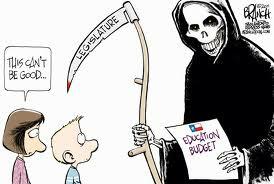 "The spending cutbacks will likely have repercussions on the state’s education system as well. The Obama administration says $13.8 million in financing for primary and secondary education is slated to be axed. This would mean a cut in funding for around 50 schools, putting the jobs of approximately 190 teachers at risk and impacting nearly 12,000 Hoosier students. "Paul Woodling, an economics teacher at Northwest High School in Indianapolis, says services designed to aid children with learning disabilities would likely feel the brunt of the spending cut impact at his school. "Funding for Indiana’s tax-supported health services may also fall victim to the impending cuts. Penny Caudill, the administrator of the Monroe County Health Department, says while the health department does receive most of its funding via local taxes and fees, a drop in federal money it collects through the state would damage some department programs enjoyed by some 2,000 clients in the area. "Another potential victim of the government sequester would be anti-violence programs such as the ones at Middle Way House in Bloomington. "Executive Director Toby Strout says federal funding cuts would mean she would have to shut day care, youth programs, and legal services. "A litany of other programs and services, such as Head Start programs, child care for low-income families, nutrition assistance for seniors and more, are projected to be impacted throughout the state if Congress does not act to forestall the indiscriminate budget cuts. 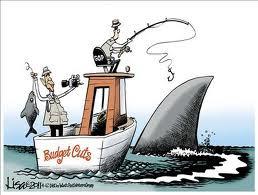 "Amy Brundage, the Obama Administration’s deputy press secretary for the economy, emphasized in a press conference that the sequester is not only avoidable, but was part of a plan set previously by Congress to encourage bipartisan negotiations to balance the nation’s budget. "Back in Washington, however, bipartisan negotiations on carving out a new federal budget have stalled, and Democrats and Republicans blame each other for the impasse.'" As the axe falls on other States, more of us will be able to see the true nature of the Conservative leadership: a criminal enterprise devoted solely to the establishment of a Power Elite (http://en.wikipedia.org/wiki/The_Power_Elite), to rule over the 98% under a New American Feudal Empire.